You’d think running a fledgling beer t-shirt business as a finance and marketing student would get you extra points with your New York University lecturers. But instead, in 2004, it got Roy Laniado thrown out of his dorm room. Like many universities, NYU bans running a business for profit from student dorms. Laniado, who was born in Myrtle Beach, South Carolina, moved to Israel and then to South Africa, where his father owned a textiles company. As a child, he spent each summer working for his relatives in South Carolina in their retail store, Bargain Beachwear, which sold beach supplies and tourist necessities — as well as licensed beer apparel. He relocated to the U.S. in 2001 as a 17-year-old and after a year working for Bargain Beachwear in Myrtle Beach, began his major in finance and marketing at New York University. In August 2004, he discovered Corona beer t-shirts on eBay — the type that were sold at Bargain Beachwear — at an inflated price. Realizing he could undercut the eBay seller, Laniado bought some merchandise from his father and began selling it on his personal eBay account. About four months and 329 eBay transactions later, Laniado launched WearYourBeer.com. 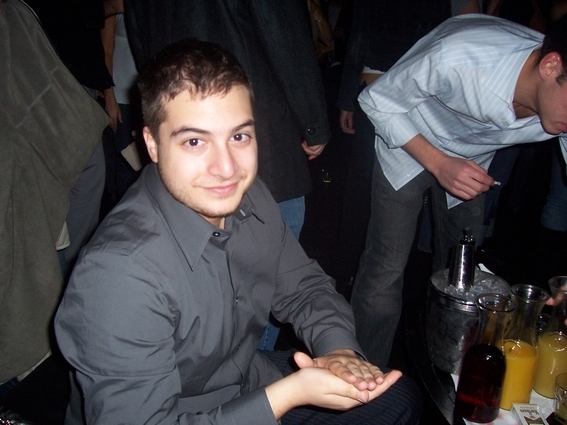 In March 2005, NYU officials realized Laniado was running a business and forced him to live off-campus, where he ran his start-up from an apartment in Queens. WearYourBeer has grown steadily in revenue, from $97,700 in 2005, to $223,065 in 2006, $620,176 in 2008, and $1,300,000 in 2011. To date, with the busiest quarter to begin, WearYourBeer has recorded $1,020,00 in revenue this year. Laniado hopes it to be a $10 million dollar company by 2015. Laniado taught himself HTML from reading books and learning online and within two weeks, had created the first website for WearYourBeer, using the open-source shopping cart osCommerce. In May 2005, WearYourBeer switched to shopping cart software CRE Loaded, which is derived from osCommerce. Inheriting many of its features such as inventory control, content management, and the ability to add admin accounts to the backend, and including many others, it has a one-time fee of $50. WearYourBeer initially used PayPal because it was inexpensive and easy to use. The business switched to accepting credit card payments through Fidelity Payment Services in 2007 because it provided the more competitive processing rate of 2.1 percent. Laniado began selling WearYourBeer products from his dorm room, making daily trips to the U.S. Post Office to deliver packages for shipping. Two years later in 2007, WearYourBeer relocated to a nearby office and warehouse in Queens from which USPS collected items. In 2010, Laniado outsourced order management, inventory management and fulfillment to The Holcombe Group, a third party warehouse shipping center in Pennsylvania, which was recommended to him. 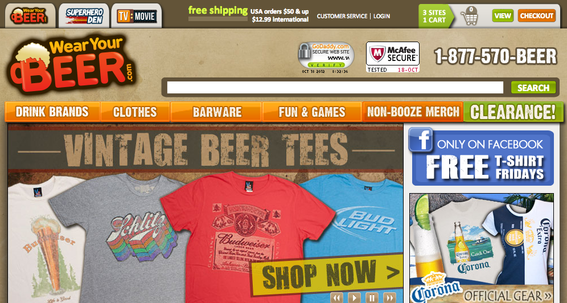 WearYourBeer initially used GoDaddy for website hosting because of its low cost. Laniado then used a small hosting company in Queens because he liked the business owner, enjoyed helping a local firm, and it was inexpensive. Laniado did everything himself from August 2004 until May 2006 when he opened an office and hired someone to pick and pack boxes and manage inventory. A year later, the company moved into a new office with an attached warehouse and hired a second employee to pick and pack orders. At this time, Laniado began hiring freelance web developers to work on the website. As business grew, WearYourBeer added another employee for fulfillment, so that by Christmas 2009 it had six people working in-house. After the 2009 holidays, Laniado outsourced inventory management and fulfillment tasks to The Holcombe Group. WearYourBeer hired an SEO agency in Chicago 2008 but had little success. It then hired a freelancer in late 2009, who worked on SEO for the next two years. Laniado’s in-house marketing manager, who was a senior marketing strategist for an online marketing firm in New York and replaced the freelancer at the end of 2011, includes SEO amongst his responsibilities. Today, Laniado says WearYourBeer has a return on investment of $0.90 in profit for every marketing dollar spent. Laniado says that WearYourBeer currently ranks number one for 207 keywords, and is somewhere on page 1 of Google’s organic search results for hundreds more. Via its Pennsylvania distribution center, WearYourBeer uses a combination of USPS and UPS shipping options. WearYourBeer began with just one Canadian and two U.S.-based vendors, which Laniado discovered after searching online for wholesalers, and after attending such trade exhibitions as the Las Vegas MAGIC Show and The Surf Expo in Orlando, Florida. WearYourBeer now has 115 vendors and stocks approximately 6,000 products. For several years, WearYourBeer’s inventory management consisted of a laptop, an Excel spreadsheet, and a handful of boxes with merchandise in an apartment. Laniado then progressed to keeping inventory in an office, and then in the warehouse attached to the second office. Today, inventory management is handled by The Holcombe Group, which receives the merchandise, and then organizes, stocks, and picks and packs it. Laniado originally used an Excel spreadsheet to keep track of revenues and expenses. In May 2006, he began using QuickBooks and has been using it ever since. Surprisingly for such a youth-oriented company, WearYourBeer has not found success with social media. All employees help contribute to Facebook, Twitter, and other social media platforms, but WearYourBeer is concentrating on other priorities. Laniado watches the income statement everyday to make sure nothing is getting out of hand. Laniado answered customer phone calls and emails until one of his employees, Lori, undertook it in 2007. Laniado cites two common mistakes to many new businesses: attempting to save money on hosting and waiting too long to hire employees. Laniado has been delighted with his company’s solid growth. Laniado has also been pleased with his company’s reputation for good customer service, quality products and good prices.